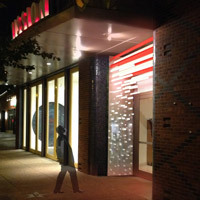 Zimmerman's installation will light up the RAC on Delmar. Brian Zimmerman's winning design for the Delmar entryway to the Regional Arts Commission (RAC) will unveil -- and light up -- to the public Thursday, Oct. 29. Zimmerman, assistant professor in the Leigh Gerdine College of Fine Arts, was selected for a $20,000 commission from among 30 artist submissions in 2014 as part of RAC’s highly visible public art project. The new entryway panels will illuminate a portion of Delmar Boulevard, one of "10 Great Streets in America." Zimmerman’s design, titled "Conjoin and Allure," is a sculptural light installation consisting of two, twelve-foot tall, mirrored stainless steel panels pierced by nearly three hundred acrylic rods and tubes. Learn more at the RAC. The opening is from 5:30 - 7 p.m., with the lighting commencing at 6 p.m.
Susie Michailides, professor and vice chancellor for Academic Affairs at Webster Athens, represented Webster at an international conference held at the LN Gumilyov Eurasian National University in Kazakhstan on Oct. 16. The conference, "International Economic Activity in Times of Global Financial Turbulence," covered a range of topics such as market globalization as basis for economic development; foreign trade and competitiveness; sustainability of national economies in world markets; and, the economic challenges of the 21st century. Michailides delivered a speech, "Globalization in Education," that focused on the conceptions of higher education; cosmopolitanism; the development of the Global student; Internationalization of the Curriculum and the Global Self; and, Education for Citizenship and a Better World. “Globalization impacts directly the way students understand and apply their disciplinary knowledge, thus education must empower them to develop a set of values that will transform young people now and in the future," Michailides said. 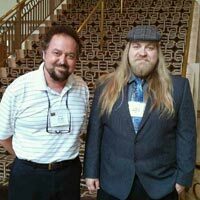 Terry Cooper, adjunct professor in Religious Studies, and Matthew Wilkinson '14, a Religious Studies alumnus and a current Webster graduate student in Counseling, presented their paper, "Casting Out Pathology and the Analyst’s Vulnerability: Some Unexpected Lessons from The Exorcist," at the 38th Annual Conference of the International Association for Psychoanalytic Self Psychology in Los Angeles on Oct. 18. The conference theme was “Self Psychology in a Multidisciplinary World: Expansiveness and Constraints.” They plan to publish the paper. Gladys Smith, assistant director of Counseling and Life Development, recently completed her doctoral defense for the Psy.D. doctor of psychology degree from California Southern University. The topic of her research was "African-American Women: Trauma and Resilience."